The Vario-Pergola self-supporting sunroof is perfect for courtyards, decks and outdoor living areas. 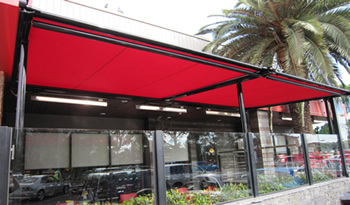 The new Vario-Pergola is suitable for a wide variety of commercial and residential applications. It can be installed using wall or ceiling brackets and doesn’t require an existing structure, as it supports itself on 60x60mm square front posts. Lightweight but robust, the Vario-Pergola is based on the popular Varioscreen system and comes with integrated water gutters on the side tracks allowing outdoor areas to be utilised in light rain. For a projection of more than 5250mm, 3 x support rollers are mounted.